Tuesdays child is full of grace; meaning favoured by God, meaning very, very lucky. Many of you will know the story of ‘tuesdays with Morrie’. For those who don’t, it is a philosophy of life and living distilled by the awareness of impending death and diminishing physical ability. Morrie Schwartz is an old man, a professor of sociology. He has ALS and not long to live. Over a series of Tuesday meetings with a former student, Mitch Albom, Morrie attempts to pass on the wisdom he has spent a life-time accumulating and practicing. Morrie is fully aware of the pressures for living an ordinary life, although he never succumbed. “Mitch”, he says, “the culture doesn’t encourage you to think about such things until you’re about to die. We’re so wrapped up with egoistical things, career, family, having enough money, meeting the mortgage, getting a new car, fixing the radiator when it breaks – we’re involved in trillions of little acts just to keep going. So we don’t get into the habit of standing back and looking at our lives and saying, Is this all? Is this all I want? Is something missing?” He paused. “You need someone to probe you in that direction. It won’t just happen automatically”. I guess Morrie was born to be an instructor too. When it comes to discussing family, Morrie takes no prisoners. He quotes Auden from his poem,’September 1 1939′ “Love each other or perish”. On the Sixth Tuesday, Morrie talks about detachment. “What I’m doing now”, he continued, his eyes still closed, “is detaching myself from the experience”. 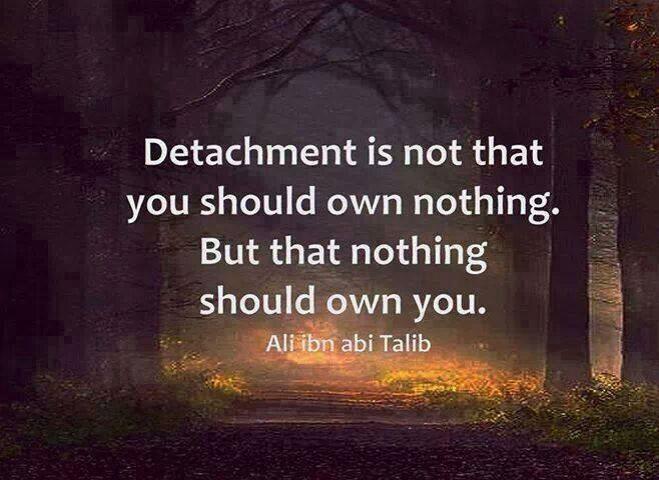 Detachment is one of the huge lessons to be learned if we wish to become wise. It is also one that very many people grapple with. In my philosophy class, we struggled with this idea of detachment, afraid that it would mean that we had to forgo all passion for life and living, for all involvement, even for football. “Not so”, the philosophers tell us, “on the contrary even”. Ekhart Tolle has a great explanation of ‘detachment’ in his book ‘A New Earth’ which is on our list, of course, and which we shall visit soon. The Buddha to, spoke about detachment and we shall visit his words too. Here is a quote attributed to Ali ibn abi Talib, a cousin of Mohammad’s. Detachment is significant for emotions and ideas as well as for physical belongings. Morrie has his own explanation, “But detachment doesn’t mean you don’t let the experience penetrate you. On the contrary, you let it penetrate fully. That’s how you are able to leave it”. This doesn’t mean a lot to Mich Albom who replies, “I’m lost”. We are with you there Mitch. Morrie elaborates a bit further, “Take any emotion – love for a woman, or grief for a loved one, or what I’m going through, fear and pain from a deadly illness. If you hold back on the emotions – if you don’t allow yourself to go all the way through them – you can never get to being detached, you’re too busy being afraid. You’re afraid of the pain, you’re afraid of the grief. You’re afraid of the vulnerability that loving entails. But by throwing yourself into these emotions, by allowing yourself to dive in, all the way, over your head even, you experience them fully and completely. You know what pain is. You know what love is. You know what grief is. And only then can you say, “All right, I have experienced that emotion. I recognize that emotion. Now I need to detach from that emotion for a moment”. You can only really experience your emotions and be alive if you can practice detachment. Morrie is giving us the same advice deMello did in ‘Awareness’. Remember the 4 Steps to Wisdom, especially Step 3, ‘Never identify with the feeling. It has nothing to do with the ‘I’. My feelings are in me, they are not me”. I checked one of those web-sites which can calculate which day of the week you were born on. 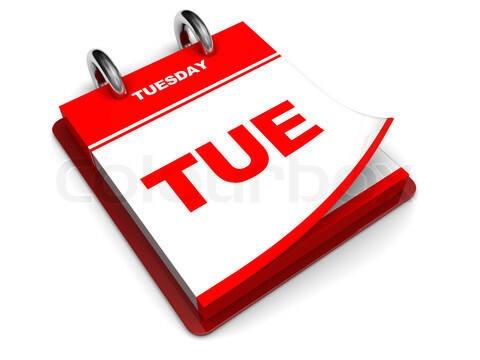 I filled in the data and, hey presto, i was born on a Tuesday. Didn’t even hear my ego sneaking up on me. “Hey look, look”, i was ready to call to the world, “i’m a Tuesday child, lucky me”. Oops, totally undetached. Maybe I should concentrate my studies on nursery rhymes.